ABC Wednesday: Zounds, it is Z-Day! Gad zooks! Can you believe we have traveled from A to Z one more time on ABC Wednesday? We have zigged and zagged and zipped our way to Z-Day! It’s been zany and zingy, and your contributions have caused me to sing “Zip-a-dee-do-da, my oh my what a wonderful day” or “Zing went the strings of my heart,” but never would you have heard the “zzzzzzz's” of my falling asleep. So thank you for making this round of Mrs. Nesbitt’s brainstorm such a success! Let’s celebrate with a house party -- the best dance music I know is Zydeco which you can tap into at Louisiana Zydeco Live. For a good history of Zydeco and Cajun music, visit "Contemporary Cajun, Creole, and Zydeco music". And there will be a next tour of the alphabet so “Come on back, you all!” Remember last week's message form Mrs. N -- WE NEED YOU! It's been a fun A-Z Round 8. I can't wait to see what all the ZZZZs are about today. Buzzzzzzing on home for now. "Z" is bitter sweet. I joined in the middle of this round - LOVE participating both in the posting and participating and can't wait to start round 9!!!!! Thank you, thank you, thank you to all of you who work so hard at keeping this up. Great introduction to the letter Z. I've enjoyed my second round with ABC Wednesday. Lots of fun. I think I posted mine a little early, so will be back to link up at 4pm, although I'm not sure which time zone that would be. LOL. Will Round 9 start next Wednesday?? Wonderful dancers! Thanks for showing this video! Huh. A round finished and believe me I loved it though I started mid way almost towards the end. Waiting for more. Loved all the posts of bloggers on ABC Wednesday! From A- Z (almost) and back again hopefully next week :) Happy to offer to help out but unable to do so until late September. Love your Z picture - I joined half way through ABC Wednesday - and am looking forward to the next alphabet run - nearly missed it today pc has been down most of the day ! Hallo! I uploaded my photo for the first time on your ABC wednesday. If there is any mistake, please let me know. Have a nice Days! It waz zo fun participating in thiz zenzational meme! This round zipped by! Can't wqait for the next round to begin!Well done team! cant wait for next round! one of my favorite memes. Forget Zydeco - try Zumba! 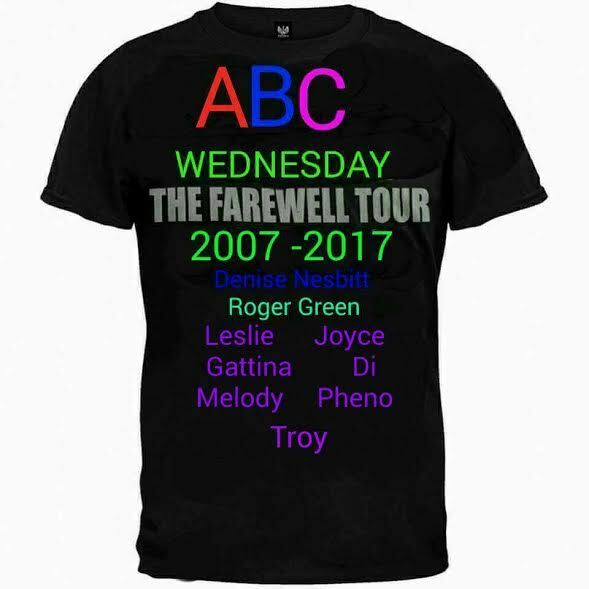 I've enjoyed my return to ABC Wednesday, but sadly won't be able to join in on Round 9. Thanks to the ABC Team for doing such a grand job and I hope everyone participating a happy Wednesday! Round 9 here we come! I'm looking forward to Round 9. When will it start?